My Dad was an orthodontist, which might lead you to believe I have the healthiest teeth and gums, but like the cobbler’s child who has the worst shoes, so goes my teeth. Mine are especially susceptible to decay. The only advantage my father’s profession gave me was being indoctrinated from an early age that your teeth and gums are indicators of your overall well-being and taking care of them was essential to good personal environmental health. I learned that a good dentist can help troubleshoot links to cardiovascular disease and diabetes or Alzheimer’s and that periodontitis has even been connected to premature births. As with most things in my life I gravitate towards finding those who take a holistic approach to dentistry, like Dr. Chester Yokoyama in Los Angeles. A simple Google search landed me at the door of Dental Healing. The first time I walked into his office I knew I was in the right spot. The bamboo floors that made me feel as though I was walking on air combined with the fresh air smell and natural light were my early clues that not only did Dr. Yokoyama offer a holistic approach to medicine, he operated a sustainable business. 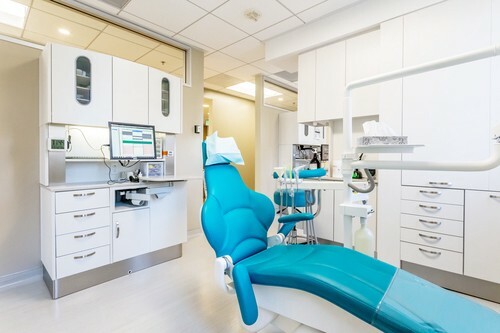 I later learned that the office was designed with the help of Green Life Consulting following LEED certified standards and that Dental Healing was the very first dental practice certified by the city of Los Angeles as a green business and to be recognized by California as a climate leader. One of the things that make Dr. Yokoyama exceptional is that he takes a holistic approach to a new level. The son of a dentist, he “always thought that there must be a better way to practice dentistry than to drill, fill and bill.” Not only does he focus on the use of non-toxic materials and the impact dental infections and materials traditionally used in dentistry have on his patient’s overall health, but also on their effects on the environment. Traditional amalgam fillings contain mercury, which the FDA deems safe in dentistry, but are very controversial and can be dangerous to your health. In his practice he uses biocompatible materials like porcelain, avoiding metals in the mouth. He offers a blood test to determine which materials are most suitable and only uses those that are harmonious with their bodies. He avoids toxic fluoride therapies and suggests alternative kinds of toothpaste like Theodent, which uses the cocoa bean instead of fluoride and is not harmful if swallowed. Dr. Yokoyama also just became SMART certified by the International Academy of Oral Medicine and Toxology. What that means is he follows the protocol for the safe removal of mercury amalgams. An unsafe process will release mercury vapors and particles that can be harmful to the patient, the dentist and their staff and the environment. Located in California, his practice is drought-conscious and uses a water free vacuum system. They also use filtered water tanks, which trap any mercury or solids before that water is released back into the municipal system. Their dry vacuum water system saves an incredible 480 gallons of water every day! When possible in lieu of the traditional drill and its noise they use lasers which also eliminates the need for novocaine for numbing. The air-filtration system they chose eliminates that traditional medicinal smell. There is no recycling of air, leaving the interior as sterile as a surgical operating room. Beyond running a sustainable business in an aesthetically pleasing green environment and offering a holistic approach to dentistry, Dr. Yokoyama has built a team that is truly living with a green heart. Everyone is pleasant, eager to help and conscious of the impact they are making on their patient’s environmental health right down to the bamboo toothbrushes at the front desk. Because of my propensity to cavities, semi-annual visits to the dentist have been a staple of my personal environmental health plan; although this January I was told that my two cavities warranted me upping that number to three visits! Luckily for me, a visit to Dental Healing is not something I dread. You can find more out about Dental Healing here. Other good resources to find holistic dentists in your area are the Holistic Dental Association and the International Academy of Oral Medicine and Toxology.